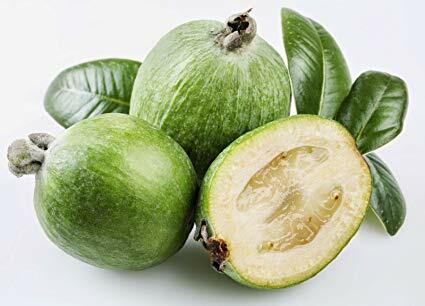 Feijoa (Feijoa sellowiana Berg or Acca sellowiana) is a plant species of the family Myrtaceae, native to the southern Brazilian plateau, northeastern Uruguay and Argentina. The feijoa, also known as pineapple guava or guavasteen, is an evergreen shrub or small tree which produces small, tasty fruit in late summer and early fall. Feijoa fruit like the guava is a good source of Vitamin C with low in calories and a rich source of minerals and fiber. The most notable feature of the mineral nutrition of developing feijoa fruit was that the calcium, magnesium and potassium content of the fruit continued to increase until the fruit fell from the tree. The micromineral contents, such as iron, copper and zinc, did not present significant variations throughout the ripening stages. Although it is usually for the potassium content of fruit to increase with growth, the movement of calcium and magnesium into fruit often ceases at a comparatively early stage of fruit growth. The calcium and magnesium concentration in the fruit declined during the initial stages of fruit growth (40 -80 days after anthesis), but declined only slightly or not at all during the phase of rapid growth. Because calcium is relatively immobile in the phloem, and is conducted to developing fruit via the xylem it has been suggested that calcium movement into fruit it reduced when the xylem ceases to become the main channel for nutrient flow into fruit. Although this phenomenon may occur in many fruit trees, calcium and other nutrients may be supplied to feijoa fruit during its final growth phase by the xylem. Calcium, magnesium, and potassium content of feijoa fruit increased throughout maturation.